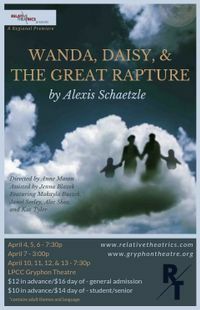 With partial funding by the Wyoming Arts Council and the National Endowment for the Arts, Relative Theatrics presents the Regional Premiere of WANDA, DAISY & THE GREAT RAPTURE by Alexis Schaetzle on the stage of the Laramie Plains Civic Center (LPCC) Gryphon Theatre April 4-6 at 7:30pm, April 7 at 3:00pm and April 10-13 at 7:30pm. All performances are followed by a chat-back with the actors and design team. Audience seating is on stage and there is a limit of 50 tickets per show so attendees are encouraged to get tickets in advance or arrive early. The play contains adult themes and language. Description: It’s a sticky hot summer in the swamplands of Crawley, South Carolina. Step-sisters Wanda and Daisy struggle to get by as the people they love disappear; Wanda’s mother has recently died, and Daisy’s father's mysterious illness worsens, and his obsession with an impending rapture intensifies. The girls try to repair their fractured relationship by summoning dark memories in hopes of finding a little light. A magical story about how we hold onto family, the past and ourselves while we seek better lives, and wait patiently as the Great Rapture hails us--or doesn’t. WANDA, DAISY & THE GREAT RAPTURE is directed by Anne Mason, assisted by Jenna Blazek, and features Makayla Buszek, Janel Seeley, Alec Shea, and Kat Tyler. Tickets: Tickets are $12 in advance or $16 the day of the performance (subject to availability). Student and senior discounted tickets are $10 in advance or $14 the day of the show, with ID. Tickets can be purchased online at www.gryphontheatre.org or at the LPCC ofﬁce (room 110) during its business hours Monday through Friday 9am to 4pm. Admission is limited to 50 seats per show. Tickets may also be purchased in person at Coal Creek TAP for the set price of $12 plus a nominal ticketing fee. Patrons with proof of advance ticket sales can receive a pizza and two beers at Coal Creek TAP for $20. Relative Theatrics strives to present thought-provoking theatre that examines the joining qualities of the human race. We believe that theatre is a forum with the power to illuminate the binding qualities of humanity and reinforce the ideals that as a society we have values that pose as common ground and emotions that relate us to one another. Taking artistic risk, we provide a community gathering place where thoughts can be exchanged about society, culture, and the power of creativity.